Mountainside Active Retirees (M.A.R.) is a senior organization that was founded in 1983 to promote cultural, educational, recreational and social activities to senior members of the community. Our membership is composed of residents, aged 55 or more, retired, soon to be retired, or just wishing they were retired. Membership is also available to non-residents of the same age if they are sponsored by a Mountainside resident. We meet on the 2nd and 4th Tuesdays of the month at the Mountainside Borough Hall, 2nd floor, Community Room. Our direct contact with the Mountainside Council is Kim Moriak, Senior Citizen Coordinator. On December 11, 2018 during a regularly scheduled meeting of the Mountainside Active Retirees, Mountainside Senior Citizen Coordinator Kim Moriak was presented with a Proclamation plaque in her honor by the M.A.R. board for her countless hours of unselfish time and energy in support of the seniors of Mountainside. 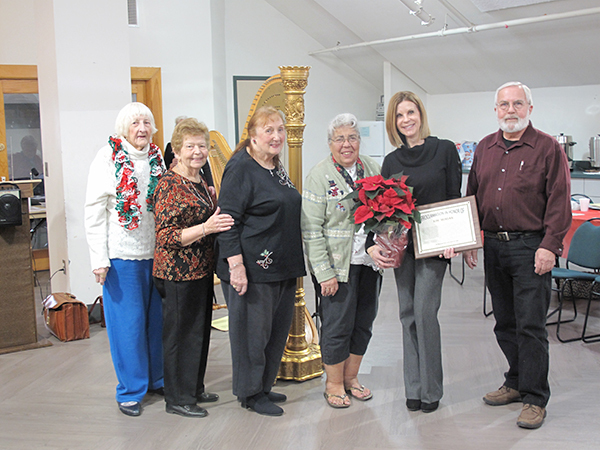 During the meeting, Mountainside resident and professional harpist Joanne Hansen entertained the group with beautiful music selections while the members enjoyed homemade cookies they brought for the second annual cookie swap. During a musical intermission, Ms. Moriak was presented with the plaque and flowers. The presentation was a complete surprise to Ms. Moriak. (above, l-r) Members of M.A.R. at their December meeting Norma Huber, 2nd Vice President; Ellie Annis, 1st Vice President; Madeline Szeles, Recording Secretary; Ruthie Goense, Treasurer; Kim Moriak, Honoree and Senior Coordinator; and Ken Ilgavizious, President.